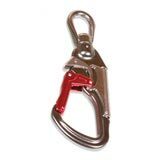 ISC Aluminum Swivel Snap Hook Tripple Auto Locking. NEW and approved by the ISA TCC for competition use. Requires three actions to prepare to open gate and gate will automatically lock upon release.